Spring Play Tickets On Sale Now! 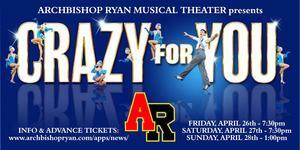 Archbishop Ryan Musical Theater presents "CRAZY FOR YOU"
Tickets are on sale now, and may be purchased in advance at the link below, or at the door. CLICK HERE TO RESERVE YOUR ADVANCE TICKETS!